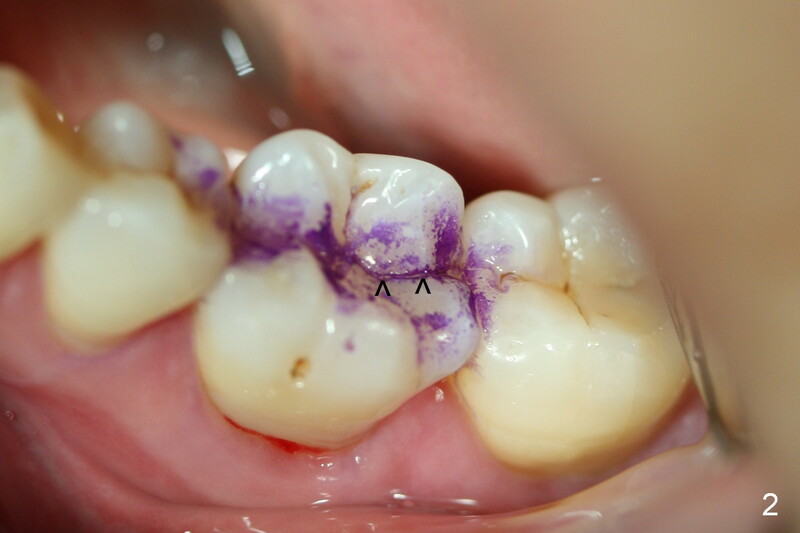 A 58-year-old lady has developed cold & hot sensitivity and chewing pain at the lower left 1st molar for the last 6 months. 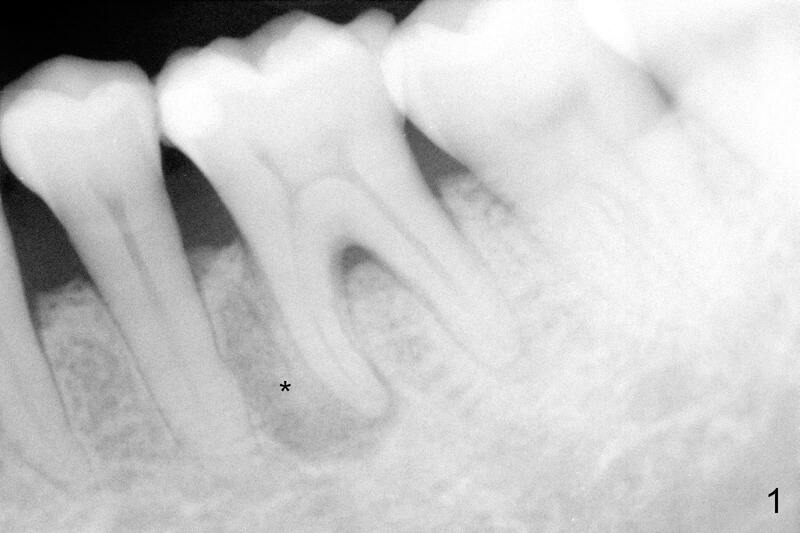 There is no caries, but large mesial periapical radiolucency (Fig.1 *). The pain has become persistent 2 days since the last visit. Careful clinical exam reveals possible distal crack line (Fig.2 arrowheads). 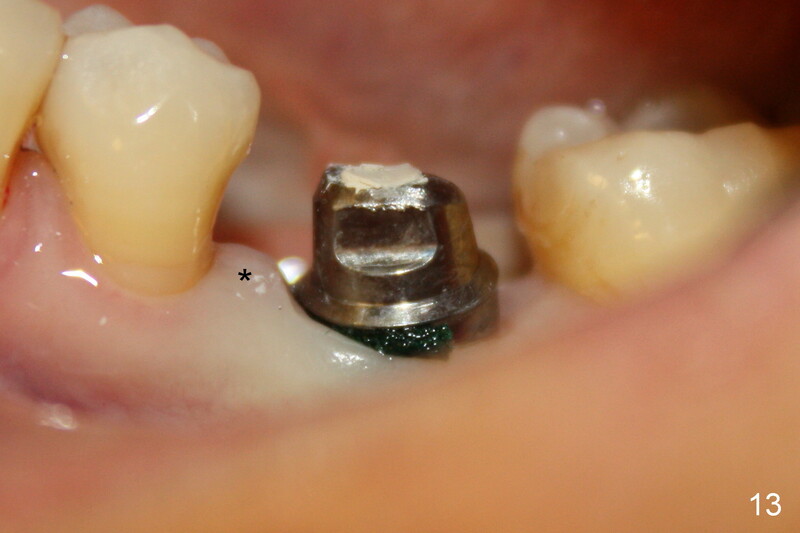 The patient agrees immediate implant. Fig.3 is an illustration of the crest (C) and the septum (S) after extraction; a bone-level implant will be placed at a level between them (Fig.4 green) with bone graft in the remaining sockets (red circles). 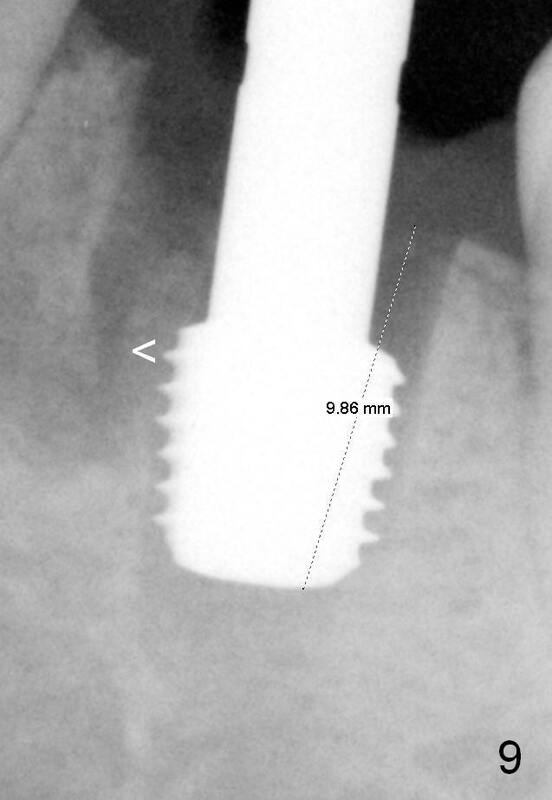 The taper of a UF extra wide implant is minimal (Fig.5). 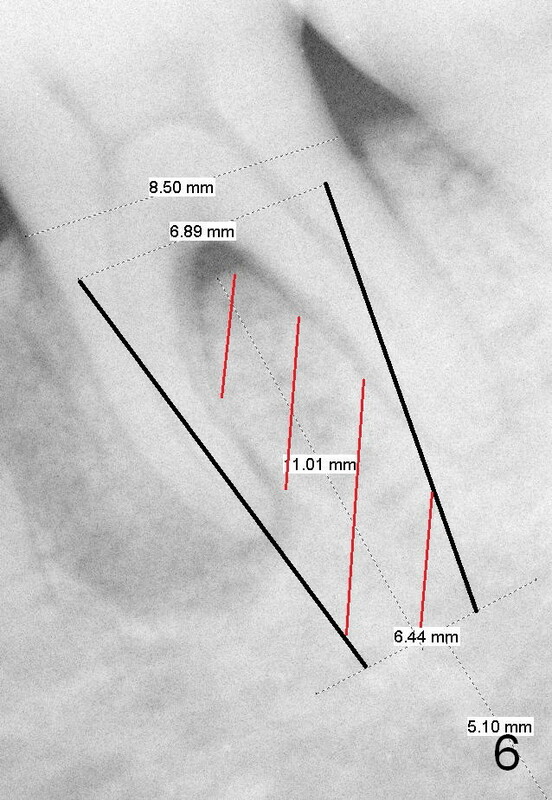 An ideal immediate implant should be as wide as possible coronally to close the socket, while the apical diameter should be much smaller (Fig.6) so that less amount of bone will be removed (compare Fig.5,6 red cross areas) and insertion will be much easier, as show below. Although there is severe radiolucency in the mesial socket (Fig.1), there is no corresponding buccal defect post extraction. Osteotomy starts in the septum. 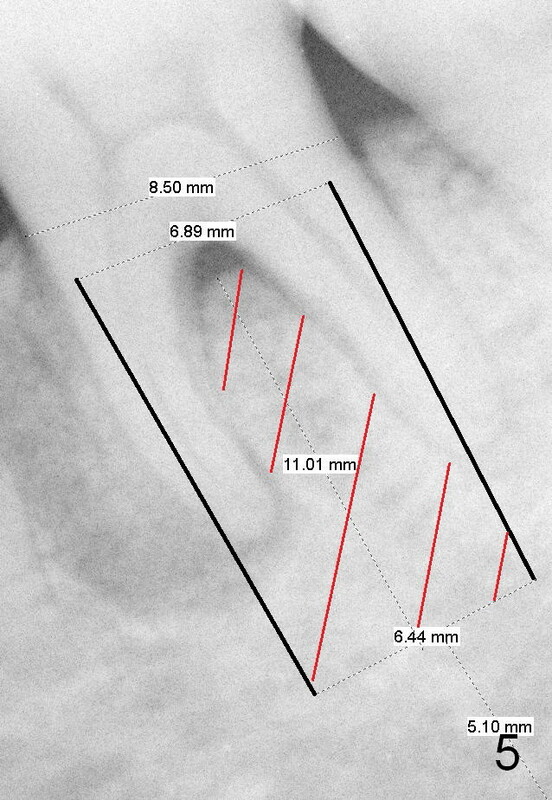 While a 3.5 mm reamer remains in the septum (Fig.7), a 6.5 mm tap deviates to the distal socket (Fig.8,9). The short universal tap is difficult to manipulate (Fig.8,9). 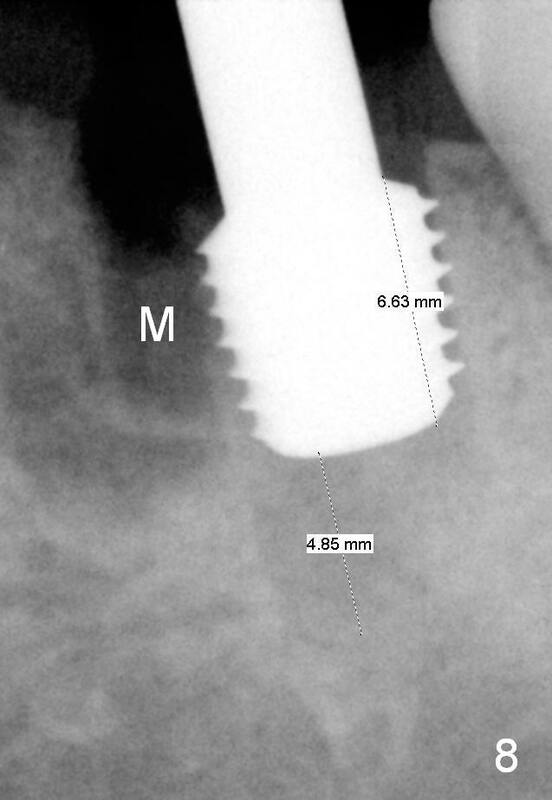 After repeated trial, a 6.5x12 mm implant is placed with insertion torque between 50 and 60 Ncm (Fig.10). It is a little deeper than planned (Fig.5). 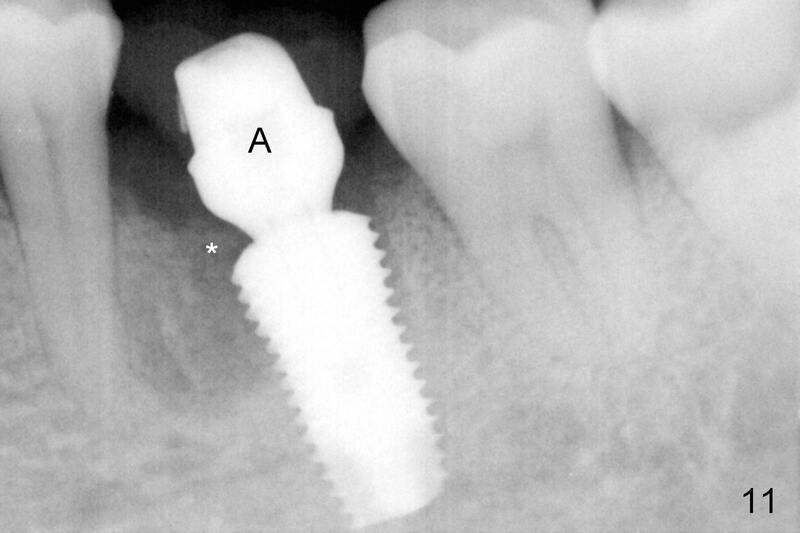 Autogenous bone harvested from reamers is placed in the remaining socket gap. There is excess bone left, suggesting placement of a UF extra wide implant for immediate purpose sacrifices native bone. In spite of this disadvantage, UF extra wide implant is safe in term of nerve injury because of the shortness. 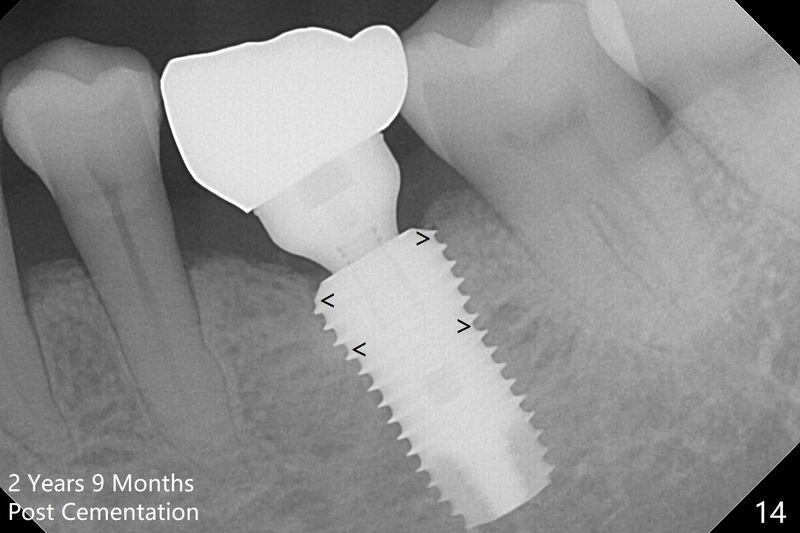 UF extra wide implant is useful for the posterior maxilla due to low bone density. Insertion may be easier. Bone-implant contact should be more. 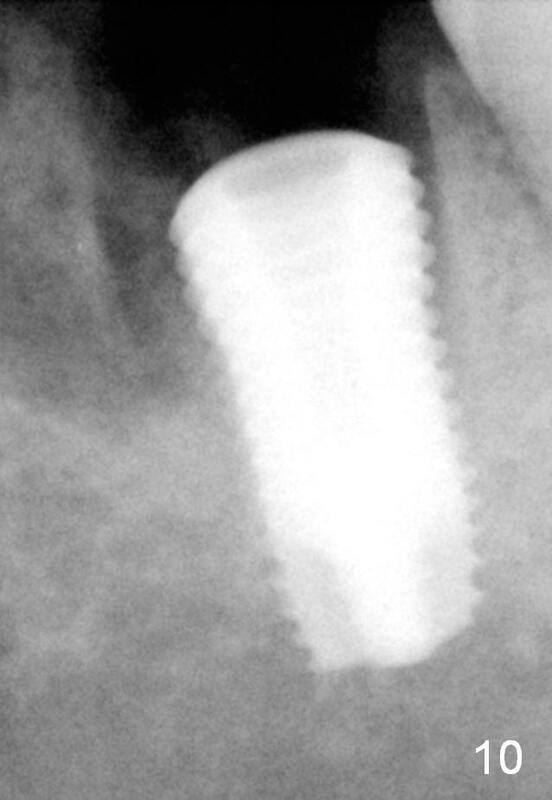 In this case, an immediate provisional is fabricated to keep bone graft in place. Difficulty in placing the UF implant in the mandible is manifested by intra- and extra-oral herpetic infection 5 days postop, which is treated by Acyclovir. The patient returns for restoration 1.5 months postop, since she is leaving the country soon. She is pleased with the provisional. 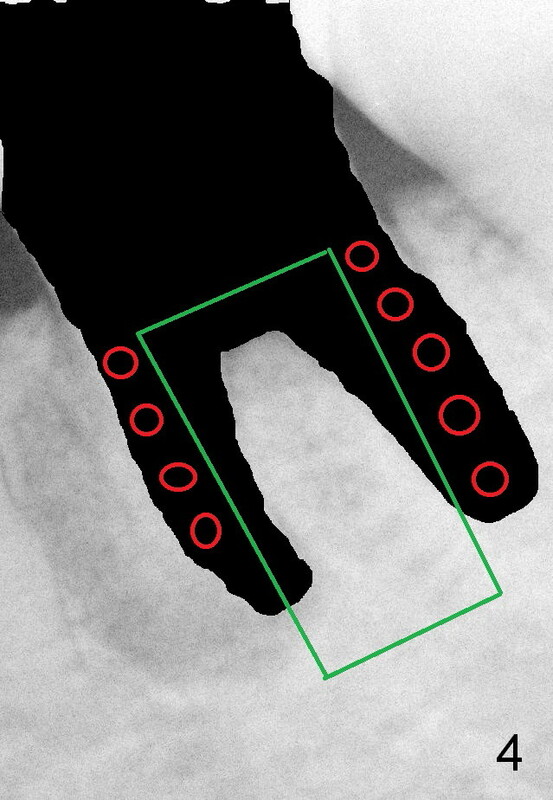 X-ray shows bone graft around the coronal end of the implant (Fig.11 *). The gingiva is healthy around the abutment (Fig.12 *). 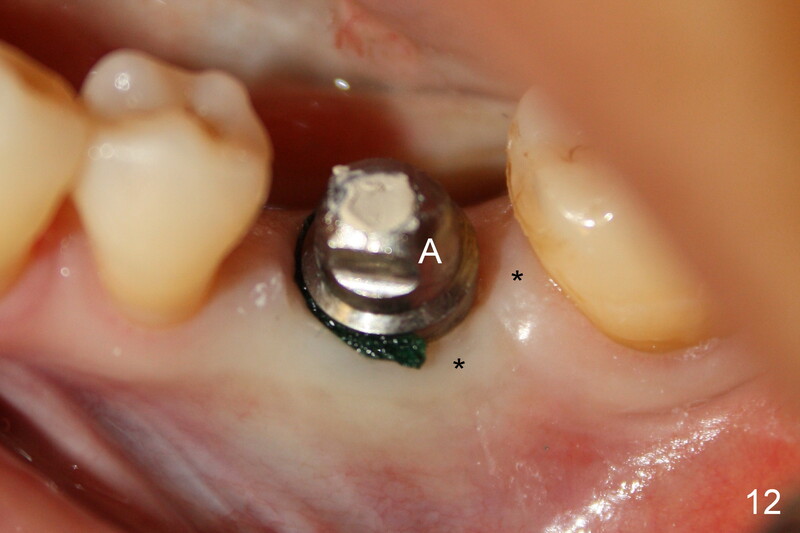 The papilla is maintained by the abutment and the provisional (Fig.13 *). 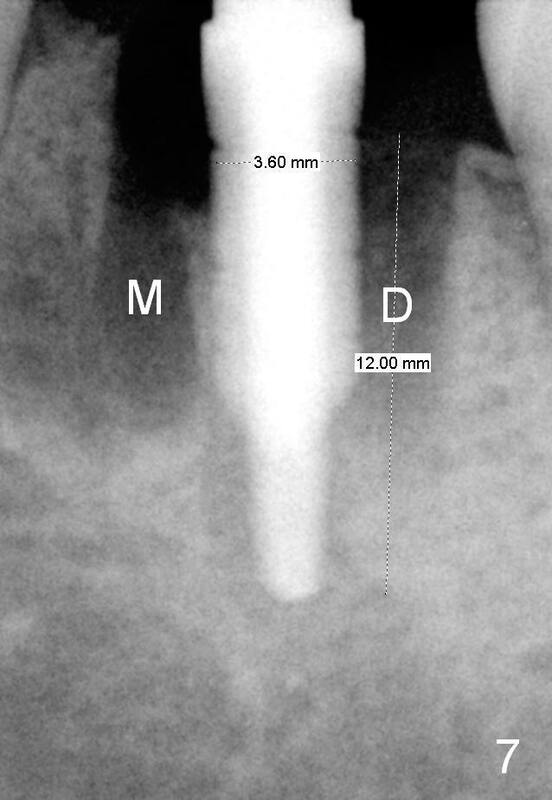 Bone density increases significantly around the coronal portion of the implant 2 years 9 months post cementation (Fig.14 arrowhead).